Armchair General November 2014 – Race to Berlin! | Armchair General Magazine - We Put YOU in Command! Home » Armchair Reading » Armchair General November 2014 – Race to Berlin! Armchair General November 2014 – Race to Berlin! Leave Feedback in the Comments box at the bottom of this page. All comments are read by the editor and publisher. BATTLE STUDIES The Battle of Cedar Creek, 1864. Union Major General Philip Sheridan turned a Confederate triumph into a catastrophe for the South in the Shenandoah Valley, by strategist Ralph Peters. SPECIAL FEATURE Blood on the Border. The U.S.-Mexican War erupted along the Rio Grande over the disputed Trans-Nueces region, by Lamont Wood. BATTLEFIELD LEADER Edward: “The Black Prince.” Prince Edward, England’s famed Hundred Years War commander, never lost a battle, by Chuck Lyons. 10 QUESTIONS Robert Dalessandro. Armchair General® interviews the chairman of the World War I Centennial Commission; by John Ingoldsby. CRISIS WATCH Insights on today’s events by strategist Ralph Peters. COMBAT! Americans vs. Soviets, Fulda Gap, 1980. Choose the correct plan for an American tank platoon to respond to a surprise enemy attack, by John Antal. YOU COMMAND Chinese Defense at Shanghai, 1937. As Lieutenant Colonel Xie Jinyuan, YOU must lead outnumbered Chinese troops facing the surging Japanese army, by Andrew H. Hershey. YOU COMMAND SOLUTION Historical outcome and winning Reader Solutions to Combat Decision Game #63, Battle on Golan Heights, 1973. WHAT NEXT, GENERAL? Konev and the Battle for Berlin, 1945. As Soviet Marshal Ivan Konev, YOU must lead 1st Ukrainian Front armies in World War II’s final offensive, by Richard N. Armstrong. NOW TAKE ARMCHAIR GENERAL WITH YOU ON YOUR MOBILE DEVICES! CLICK TO SEE INFORMATION ON ACG DIGITAL SUBSCRIPTIONS. BATTLEFIELD LEADER General Ngo Quang Truong, The Republic of Vietnam’s finest commander. BATTLE STUDIES War of 1812: Chippawa and Lundy’s Lane. The U.S. Army proved its mettle against British regulars. SPECIAL FEATURE Battle of the Bulge 70th Anniversary. Myths and realties of the U.S. Army’s greatest battle. Don’t miss out! 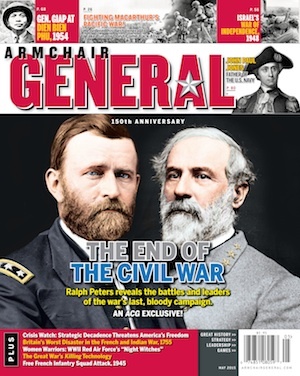 SUBSCRIBE NOW to Armchair General, the interactive military history magazine. Looking for information on a special topic? Check past issues of Armchair General magazine.